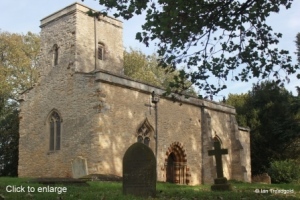 The church of St Michael and All Angels is no longer in use as a parish church and is in the care of The Churches Conservation Trust. 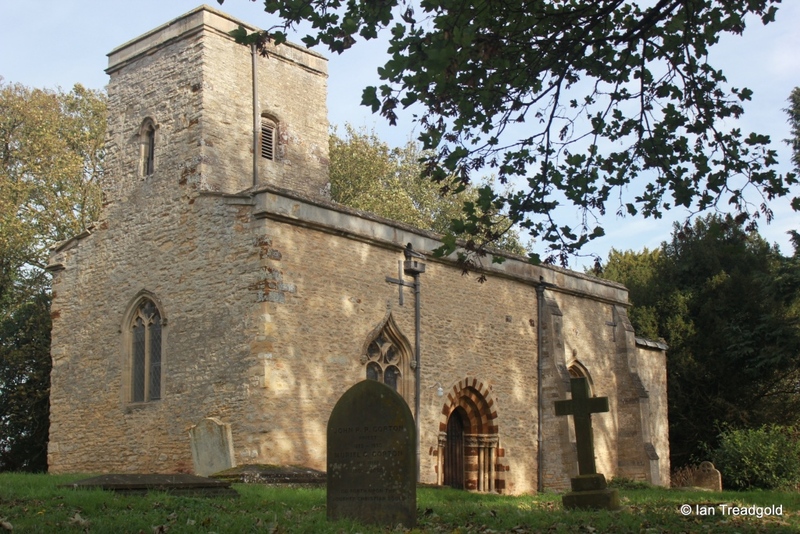 The church is situated in the middle of the hamlet of Farndish in the north-west of Bedfordshire on the borders of Northamptonshire. 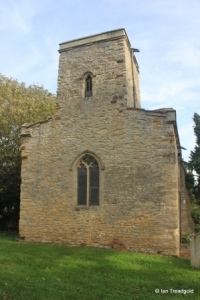 The small church has a simple nave and chancel with a tower over the western end of the nave. In total, the church is around 48 feet long with the chancel being 12 feet wide and the nave 16 feet. The tower is around 6 feet by 8 feet and 31 feet high. 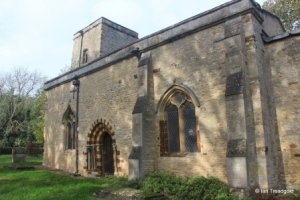 Built originally in the late C12, the church was restored in 1846 and declared redundant in 1970 before being taken on by the Churches Conservation Trust in 1974. 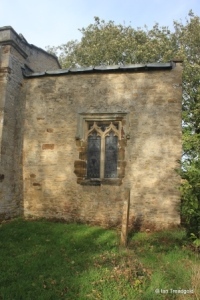 The south side of the nave has two windows on either side of the doorway. 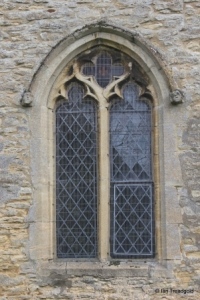 The eastern window of the nave dates from C15 and is of two wide cinquefoiled lights with a rather squat quatrefoil and sunk spandrel tracery under a two-centred arch with label stops on the hood mould with a third carved head unusually above the arch. 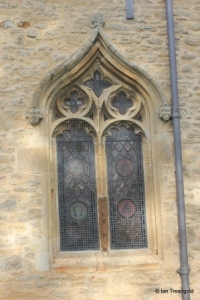 The western window is also of two wide cinquefoiled lights with quatrefoil tracery under an ogee arch rising to a finial above with carved corbels on the hood mould. 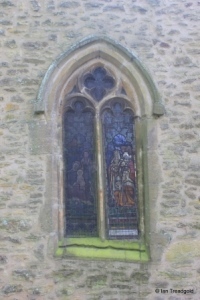 This window dates from C14. 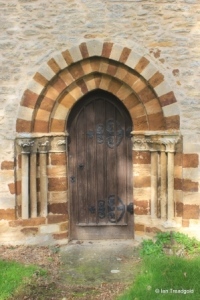 The south doorway arch is of three recessed orders of alternating light and dark stone resting on three shafts with foliate carving on the capitals. The tower, as has been mentioned, is built into the nave and the west window is of two trefoiled lights with a quatrefoil design under a two-centred arch again with carved corbels to the hoodmould. 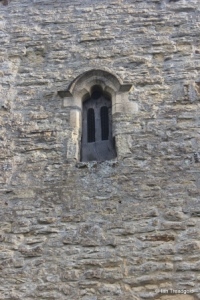 The small belfry openings above are simple trefoil headed openings with plain hoodmoulds. The top of the tower is a simple plain parapet. 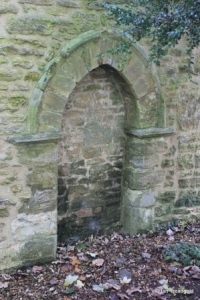 The north side of the nave has a blocked north doorway under a pointed arch. 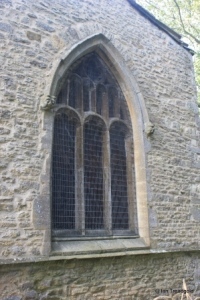 The single window on the north side is of two trefoiled lights with quatrefoil tracery under a pointed arch. 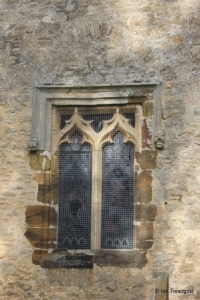 The base of the window shows signs of considerable settlement with the sill being at a slope to the base of the window. 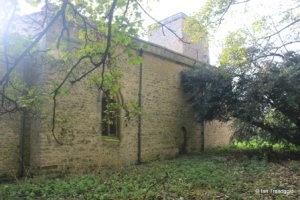 There are no windows to the north of the chancel and the east window is of three wide trefoiled lights with perpendicular tracery under a pointed arch dating from C15. 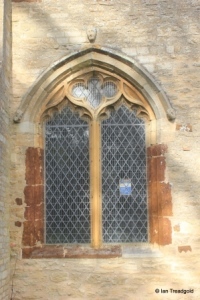 The single window on the south side of the chancel is of two trefoiled lights in ogee arches under a square head with carved labels on the hoodmould. Page last changed 03/11/2014. Reformatted 15/02/2016.